While there are many individuals in our organization that work on your projects behind the scenes, here are the sales, customer service and management team members that you are most likely to be talking with if you have questions about products and orders. Click on a team member's photo to view their favorite award! 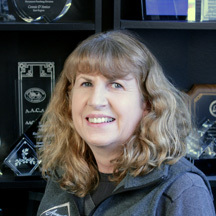 Brenda Gortowski, Senior Account Manager. Brenda handles new customer sales and existing customer orders. Brenda has extensive knowledge about our stock, semi-custom and custom products and is ready to help when you need options and ideas for your next event. She can also assist with questions on pricing, shipping, lead times, as well as questions about engraving and color fill options. Brenda is an avid crafter, and can reguarly be found turning our discontinued items into Christmas presents (really!). You can reach Brenda by email or call her at 630-687-8754. Jan Lescher, Account Manager. Jan also handles new customer sales and existing customer orders. 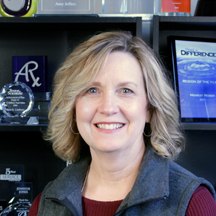 She is ready to assist with questions about product availability, lead times for orders, pricing, and custom award options. 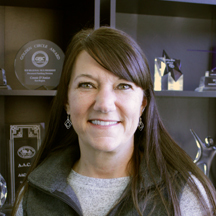 In addition to her incredible baking talents (which we all love to taste test for her) she has extensive knowledge about our entire product line and is happy to answer any questions that might arise as you are looking at options for your awards program. You can reach Jan by email, or call her directly at 630-687-8766. Paige Lewis, Key Account Manager. Paige works with many of our larger accounts, helping them to manage more complex requirements for their awards programs. When customer programs need custom designs, unique packaging, monthly releases, include stipulations for many divisions (inc. global), and customized fulfillment plans, Paige is ready to assist with ideas and options to meet these pre-requisites. She's also our resident hockey stick and puck expert (really, just ask her!). You can contact Paige by email or reach her directly at 630-687-8757. Katie Totheroh, Account Manager. 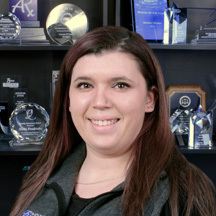 Katie also handles new customer sales and existing customer orders and is ready to assist with questions about product availability, lead times for orders, pricing, and custom award options. Katie loves to shop so if you are not sure which award is best for your program she would love to play personal shopper for you! You can reach Katie by email, or call her directly at 630-687-8752. Dave Neuman, Graphic Artist. 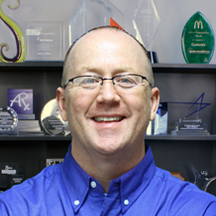 Dave is our resident expert at laying out text and logos on three-dimensional surfaces. He has a great eye for font selection, logo placement, color, sizing and spacing. 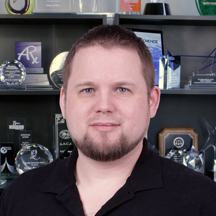 He is excellent at keeping projects on time by being responsive when making edits and sending out proofs. When he is not demonstrating his layout talents at the office, he can be found at a local car show, playing ice hockey, or building his own hockey equipment. Rippley Jacobson, Graphic Artist. Rippley is excellent at working with your text and organization logo(s), dictating size, font changes when necessary, and space utilization. She is a natural at line width (leading) and spacing between letters (kerning) and how these translate to engraving. She is excellent at keeping projects on time by being responsive when making edits and sending out proofs. Her focus on lines and space must also help her excel when bowling, one of her favorite hobbies! Shawn Dooley, Graphic Artist. Shawn is one of our most diverse artists who tackles projects which require the use of new or unusual materials, production methods, and custom design elements. He is our go-to whenever we need a photograph, a concept drawing, or logo converted so it looks beautiful when engraved. Shawn is our resident thespian, and can be found working at Riverfront Playhouse, a community theatre. He acts, directs, and stage manages for a wide variety of shows every year- another great example of his ability to wear multiple hats and juggle many projects at once. Gary Tinker, Owner. 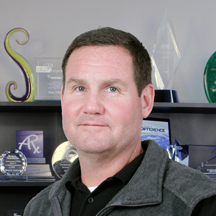 Gary oversees the day to day operations of our company with a strong eye on the overall team effectiveness and results. 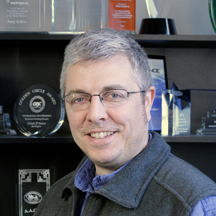 On most days, he can be found assisting with special and custom award project designs, strategizing on new markets and possible acquisitions, and reviewing long term plans. You can reach Gary by email or call him directly at 630-687-8759. 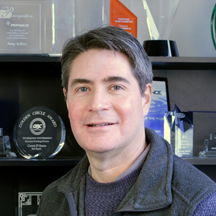 Jim Mondek, Production Manager. 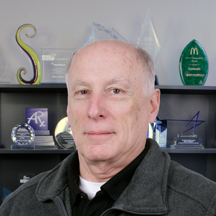 Jim brings extensive engineering and production knowledge to our team. Whether we need to engrave 500 crystal awards, 1000 plaques, or assemble a complex new custom design, he’s the man that ensures it gets done…on time, every time, and at the highest quality levels. On any given day he can be found on the plant floor, checking production rates, working with inventory staff to prep for orders and analyzing quality data, We all bet he walks 20 miles a day out there! You can reach Jim by email or call him directly at 630-687-8464. Steve Meell, Shipping Supervisor. Steve makes sure every order gets to our customers where ever in the world they need it. Whether it’s 100 vases shipping to Maine, 750 crystal units that need to ship to Europe or 30 orders that need to ship to Hawaii, he’s the man that makes sure it all happens. He can be found in the shipping department analyzing box sizes and wall thicknesses, reviewing packaging materials, and drop testing packages (which we think is really just for stress relief). You can reach Steve by email or call him directly at 630-687-8764. Danielle Young, Purchasing. Danielle is a magician in the sourcing arena. 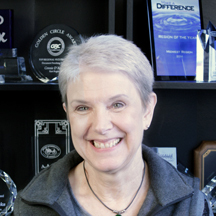 Whether we need raw materials, component pieces, packaging materials, or something totally different for a new client project…she’s the person to find it and to get it here when we need it. On any given day she has 4 phone calls going, 3 computer screens open with usage data, and has hundreds of emails in play. You can reach Danielle by email or call her directly at 630-687-8755. Eric Krause, Engraving. Eric is one we trust with laser beams! He turns the two-dimensional art proofs into our customers’ final product by calibrating and testing the precision of the laser before each order is produced. Part engineer and part wizard, his work continues as he deepens and polishes engraved areas in our sand blaster. When not on the production floor, Eric spends his time painting, playing bass guitar, and connecting with nature. Luz Cortez, Engraving. 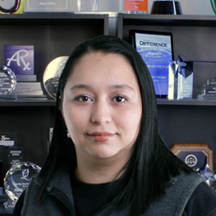 Luz has been with us for almost 10 years now, working in various areas of the production facility. She works our early shift, and despite often being here before the sun rises, she aways has a huge smile on her face. 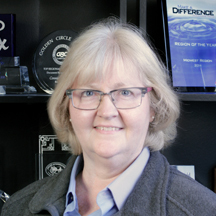 She has an exceptional eye for detail which has made her an excellent addition to the laser engraving department, processing thousands of awards every month. She has two little ones at home, who love to be taken to the park and generally keep her very busy when she’s not helping to keep our orders on schedule. Luz makes the most amazing guacamole for our company potlucks (and taught us all the secret to keeping it from turning brown after you make it).